At What Temperature Should a Refrigerator Be Set? What and how you store food in your refrigerator can affect the amount of energy that is consumed. Keeping your refrigerator full helps increase energy efficiency because there is less air to cool when space is taken up. Be careful not to overfill, though. 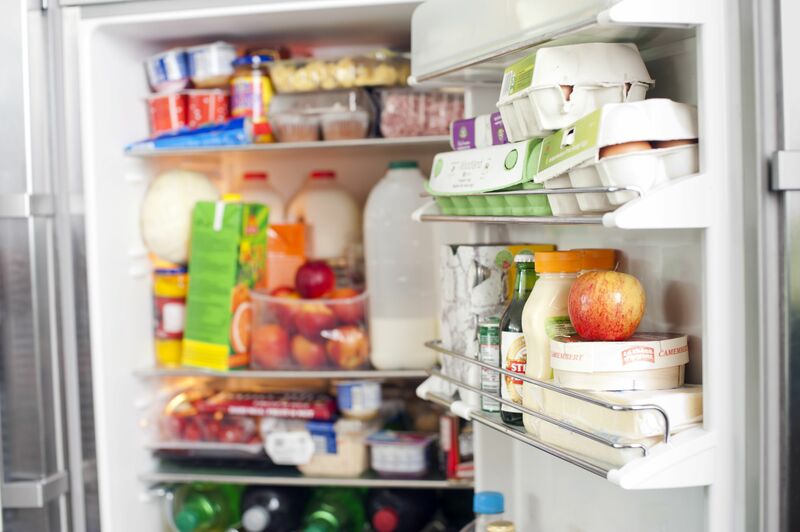 Overfilling your refrigerator can hinder air circulation in the appliance. Also, keep liquids covered and make sure to wrap foods when they are stored in the refrigerator. Not only will uncovered foods dry out and ruin the taste, but the moisture that is released causes the refrigerator's compressor to work harder. Properly maintaining your refrigerator will not only help it to last longer, but it will help save energy as well. Check to make sure that the coils behind the refrigerator are all cleaned on a regular basis and free of dust. Keeping this clean allows for better airflow resulting in the compressor working less hard than if the coils were dirty. Another thing that you should regularly do is defrost the freezer. Frost buildup should never exceed one-quarter of an inch as this will decrease the unit's energy efficiency. Making sure there is no air leakage is important as well. When cold air escapes, the compressor works harder to replace it. Perform the dollar bill test on your refrigerator door. Place a dollar bill between the door and the unit. If the bill slides out easily, air is leaking, and the hinge needs to be fixed. If it is difficult to pull out the bill, the seal on the door is in good shape. Lastly, make sure that the compressor is running smoothly. The compressor is what regulates cold air in the appliance if it is struggling to keep the unit cold, it is using more energy than necessary. If you keep your refrigerator or freezer set unnecessarily low, you can use up more energy and end up with a much higher bill. Refrigerators and freezers should not be set too cold. Refrigerators should maintain a temperature of 37 to 40 degrees Fahrenheit to work at peak efficiency and minimize energy costs. Freezers should be at 5 degrees. Stand-alone freezers for long storage can be set at 0 degrees. To check your refrigerator's temperature, set a thermometer in a glass of water in the center of the appliance. Read the thermometer after 24 hours. For a freezer, place a thermometer in between packages. Again, read the thermometer after 24 hours. The location of a refrigerator is often limited by electrical and water hookups, but when possible, situate the refrigerator strategically to maximize its use. Making sure that there is proper air flow around the refrigerator can help it run more efficiently. If the appliance is stored between cabinets, make sure that nothing stored around the unit hinders its airflow. If possible, refrigerators should not be located near windows, stoves or ovens. Heat from the sun or cooking appliances can cause the refrigerator to expend more energy to keep cool. The ideal location is the coolest spot in the kitchen.